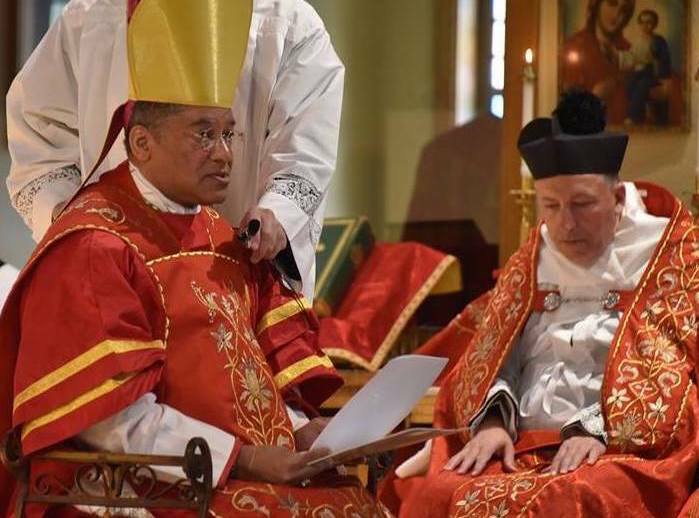 On Sept. 21st (Feast of St. Matthew), His Excellency Joseph Perry, Auxiliary Bishop of Chicago, celebrated Pontifical Solemn Mass at the faldstool at St. Adelaide Church in Peabody, Massachusetts—the site of last week’s “Culmen et Fons” liturgical conference. With his kind permission, I share his sermon here. After we had repeated this prayer, I do not know how many times we saw shining over us a strange light. We lifted our heads to see what was happening. The Angel was holding in his left hand a chalice and over it, in the air, was a Host from which drops of blood fell into the chalice. The Angel leaves the chalice in the air, kneels near us and tells us to repeat three times: Most Holy Trinity, Father, Son and Holy Spirit, I adore you profoundly and I offer you the most precious Body and Blood, Soul and Divinity of Jesus Christ present in all the tabernacles of the world, in reparation for the outrages, sacrileges and indifferences by which He is offended. And by the infinite merits of His most Sacred Heart and the Immaculate Heart of Mary, I beg the conversion of poor sinners. After that he rose, took again in his hand the chalice and the host. The host he gave to me and the contents of the chalice he gave to Jacinta and Francisco, saying at the same time: Eat and drink the Body and Blood of Jesus Christ terribly outraged by the ingratitude of men. Offer reparation for their sakes and console God. Once more, he bowed to the ground repeating with us the same prayer thrice, and disappeared. Overwhelmed by the supernatural atmosphere that involved us we imitated the Angel in everything, kneeling prostrate as he did and repeating the prayers he said. Notice, with the Fatima theophany, endorsed as being worthy of belief by successive popes in our lifetime, the Angel taught the children how to worship the mystery of God; how to offer themselves and their sacrifices in union with Jesus to the Father; how to draw life from the reception of and adoration of the Lord’s Body and Blood. The Angel catechized the children on the Real Presence and the Real Sacrifice of Christ in the Eucharist. The Angel Messenger introduced a theme that our Lady would make much more explicit in the subsequent apparitions: namely, the oblation of Christ truly present in the Eucharist that must be lived out every day in our lives. How like the Mother of God to prepare her children with proper spiritual nourishment for serious tasks she was about to hand over to them! From these acknowledged apparitions also, we can pick up on a modeling for our own approach with prayer and a disposition appropriate for handling the rites surrounding and receiving the sacrament of the Lord’s Body and Blood. We can appropriately join these three shepherd children in a faith and posture that carried them through the rest of their lives. We honor today the 10th anniversary of the going into effect of Pope Benedict XVI’s Motu Proprio Summorum Pontificum, September 14, 2007, which caught the whole Church by surprise. But then again, reading Pope Benedict’s length of writings and listening to his reasoned discourses on liturgy and his sober analysis of the state of the liturgy since the Council, we weren’t surprised. The surprise stemmed largely from our conditioning over intervening years that set forth that no order of the Mass was legitimate save that produced by the aftermath of Sacrosanctum Concilium (1963). Benedict, like an Angel from heaven, offered a catechesis that urged a respect for continuity with the Church’s rich tradition of Eucharistic worship in the Mass and informed the discussion by naming for the first time two legitimate forms of the Roman liturgy: the extraordinary form or usus antiquior with usage of the 1962 Missal of Pope John XXIII, and the ordinary form of the Mass or missa normativa with usage of the 1970 Missal of Pope Paul VI—and that both forms of the Mass can coexist side-by-side. Amidst great hope and love for the Church, priests, consecrated religious and people finding rich graces in the usus antiquior are now found in every country where Catholic faith is found; not by protest, but ever insistent and humble (if not quiet) request by the faithful over the years. It is the Mass that nourished countless saints raised to the altars within the last millennium. It is the Mass of our rearing—those of my generation and older. It is the Mass that has met up with the curiosity and devotion of young adults and young families, people who honor the rich patrimonial tradition of the Church. Naturally, the older forms are not for everyone. Ours is a distinct period of history where diversity and pluralism and participation are new code words shaping communities. Only the passage of time can judge these trends valid or invalid. The Ordinary Form of the Mass is said by some to match the religious sentiments of this age and the need of people to come together to hear and speak in the vernacular their experience of God and to touch one another in a society today that is increasingly impersonal and suspicious of the neighbor, a society less classically bent, less structured, where the informal is the new normal. Yet, just around the corner are found fellow Catholics who pray easily through elevated language that evokes the God of our ancestors and praises God through smells of incense, poetry, iconic prayer formulas and holy movement and a treasury of sacred music. Something is going on here beyond mere nostalgia. Both dynamics are givens noticeably in our society. Both dynamics, immanent and transcendent experiences, run parallel to each other in these times and exist simultaneously in complementarity and in tension with each other and, logically, spill over into religious experience. So, as Catholics we can bring out from our storeroom both the old and the new where something is rich fare for everyone. Liturgy in the Catholic experience is not simply pageantry or, for that matter, communal recreation. Liturgy emerges from the profound depths of our desire to touch God. Liturgy must speak out of the ground of the questions of today, our hopes and fears and joys. But while we do this there are forces that work interference with this God-search, forces often identified as secularism and its desacralization of life and its tendency to keep God at a distance. And we sincere religionists often get lost in the confusion of this life-dynamic because most things secular and imminent as opposed to the transcendent are often promoted as the latest fads. Subsequent to faculties to use the usus antiquior under certain conditions by Pope John Paul II in two separate initiatives, Quattour abhinc annos (1984) and Ecclesia Dei (1988), Pope Benedict did not want the Church to become disconnected from its moorings and, therefore, insisted upon the continuity of our liturgical tradition from the past to the present; that liturgical renewal can only be understood in terms of an abiding respect for how we worshipped in the past; that past was not to be discarded as so much rubbish but seen to inform and infuse wisdom for the present. Both ancient and contemporary forms provide snapshots of liturgical development going back centuries. Pope Benedict, it occurs to me, envisioned both extraordinary and ordinary forms dialoguing with each other in order to eventually come up with something genuinely suitable and workable for the Church’s lex orandi. After all, the Eucharist is the center of all activity in the Church. And its nourishment secures that we proceed with ministry in ways faithful to the Gospel, to make sure we are worshiping God in spirit and in truth. A workable dialogue this way between the two liturgical forms is possible if both forms are allowed to function side-by-side in the life of the Church where this is possible. If we can get liturgy right everything else will follow in right order. In this light, the sacrality in worship that we seek amidst the world’s current condition is not an end in itself but must show itself in all aspects of life—first in how we handle our neighbor and ministering to the agonizing social imperatives of our day, or somehow worship itself is not authentic. Life too often affords an emptiness that leaves us wondering and wandering like orphans on the street. Life for so many is sometimes like a dark night of the soul. We expect a lot out of liturgy, more so than previous generations perhaps. We lay so much that accrues as burdens placed upon the liturgy, namely, our heartfelt needs for peace, resolution and comfort. We pine to find God in our confusion. So, liturgy is a work in progress, unfinished as it is currently. Would that we could allow the dialogue without accusation and without rancor, for this search must be done together under the guidance of the Church and with mutual respect and sincerity. The optimum results we seek will be curtailed if we judge or pre-judge one another’s questions, needs and preferences. Aware that we are in search for what will aid us in our journey toward the liturgy of heaven, aware that we are in the world and not of it and that sometimes we must leave where we stand on ground in order to go to the high place to address God, Saint Paul’s counsel to the Church at Rome seems apropos here: “Do not be conformed to this world but be transformed by the renewal of your mind, that you may approve what is the will of God, what is good and acceptable and perfect.” (Rom. 12:2). In this era of vernacular worship we have searched for the right words with which to address God. We have tried several times at this rubrical task and still some feel we are not quite there. Much work lies ahead for present and succeeding generations of Catholics to find balance, to find God who is both immanent and transcendent, our God who is both unfathomable mystery and incarnate Lord. Our age finds the two in tension with each other in day-to-day life. We search to make sense of it all, similar to what is necessary in other spheres of life where tensions exist between tradition and innovation. It is probably impossible to work through this tension with mathematical or theological precision. Some of us long for God to reveal Himself in His fearsome majesty while at the same time His beloved Son Jesus is revealed to us in His simple humanity which has more potential for glory than we can ever imagine. Pope Benedict was concerned about the unity of the Church with this act of his generosity. Above all, the children should not squabble at the dinner table but be concerned about the unity of the family while we eat the same food. May we be sustained by sharing the life that food sustains. Summorum Pontificum is essentially an instrument towards reconciliation and unity while we continue to apply genius to work things out liturgically. Regardless which liturgical form feeds our inner spirit, we all hunger for beauty, because God is beautiful beyond our ability to describe and we hunger for God’s beauty that we know one day we will witness in the Kingdom. The two liturgical forms each have their own definition of beauty in complementary ways, and in other ways in contrast to each other. We have yet to achieve consensus whether there is only one way or more than one way to respect the varied religious experience of the people of God and that pluralism that has entered Catholic experience. The result cannot be accomplished by a meeting or a convention addressing such fundamental matters. The result comes after an organic development with an eye on tradition, past and present. Ideally, the result comes later, in the future, through prayer, careful attention, study and praxis. What is Catholic worship for a people dragged through the Protestant Reformation, the French Revolution, down to the sexual revolution and now the “gender revolution,” someone has asked. What structure of Holy Mass addresses and brings healing to a generation ravaged by the drug culture, fear of nuclear annihilation, and that rabid gun violence that plagues our communities? Somehow, liturgy must sacralize contemporary life in all its pathos and all its struggle. Some of us are predisposed to the image of God appearing to Moses in the burning bush; others of us are inclined toward the image of God found in Bethlehem in His incarnated humanness, in the messiness and lack of neatness found in the human condition. God is found in both experiences. We are like the several disciples at the Mount of Transfiguration who want to hold on to the light that is Jesus with us. At the same time others of us are convinced that returning to the reality of physical life down from the mountain top is just as rewarding. We have experienced both. How can the liturgy serve these contrasting images that sustain religious experience for us here and now? How can liturgy bring these religious images together to benefit the whole Church within our principal act of worship, the Mass? We crave connections between what we hear in the Word and witness here in the worshipping assembly with what is being acted out in our day-to-day lives. Contributing to this effort ideally should be a reconciliation between the extraordinary and ordinary forms. Right now one might say they exist as two camps that foist partisan division among us. We need a genius that can accomplish a marriage here. I believe this is what Benedict XVI was after. In all this we are aware that we are not the authors of the liturgy. Our Catholic worship issues forth from the Lord’s Supper, Good Friday and Easter. The paschal mystery leaves us stunned speechless before all that God has given us. The Mass must leave us wholly inspired by a narrative that keeps on saving. The age within which we live is hesitant about mystical experience, dismissing the numinous parts of life often to the macabre or the delusional. And those who might gravitate toward mysticism are often at a loss for words how to describe this dimension of natural life that is fused with the transcendent. Ordinary day-to-day parlance is absent a lexicon of words to describe mystical experience encountered in the elevated moments of life. Encroaching secularism means that the culture chooses, if not prefers, the tangible and the explainable. Could it be that the culture is too muddied to be able to decipher the presence of the holy in life? The very word “mystery” means that Holy Mass deals with things that cannot be seen with our eyes or grasped by our hands, but that nevertheless are genuine, supernatural, miraculous truths that fill us with joy. The Mass is ultimately a sacrifice. The priest, with use of the Eucharistic prayer, holds conversation with God the Father about how His Son was made a victim for our deliverance. In turn, God gives back to us His Son in the sacrament. Something takes place on that altar that only God can do. This sacrifice the Church cannot forget. The memorial of that sacrifice must be handled in every way with all due sensitivity and reverence and wonder.